The Animal Clinic - Subadrarama Rd., Nugegoda, Sri Lanka: Do You Know Enough About Rabies? Notice to all our clients. With effect from 7th December 2017, The Animal Clinic at 158, Subadrarama Road, Nugegoda is closed for business. Do You Know Enough About Rabies? Rabies is widely distributed across the globe. More than 55 000 people die of rabies each year. About 95% of human deaths occur in Asia and Africa. Most human deaths follow a bite from an infected dog. Between 30% to 60% of the victims of dog bites are children under the age of 15. Wound cleansing and immunizations, done as soon as possible after suspect contact with an animal and following WHO recommendations, can prevent the onset of rabies in virtually 100% of exposures. Once the signs and symptoms of rabies start to appear, there is no treatment and the disease is almost always fatal. Globally, the most cost-effective strategy for preventing rabies in people is by eliminating rabies in dogs through animal vaccinations. Rabies is a zoonotic disease (a disease that is transmitted to humans from animals) that is caused by a virus. Rabies infects domestic and wild animals, and is spread to people through close contact with infected saliva (via bites or scratches). The disease is present on nearly every continent of the world but most human deaths occur in Asia and Africa (more than 95%). Once symptoms of the disease develop, rabies is fatal. The first symptoms of rabies are flu-like, including fever, headache and fatigue, and then progress to involve the respiratory, gastrointestinal and/or central nervous systems. In the critical stage, signs of hyperactivity (furious rabies) or paralysis (dumb rabies) dominate. In both furious and dumb rabies, some paralysis eventually progresses to complete paralysis, followed by coma and death in all cases, usually due to breathing failure. Without intensive care, death occurs during the first seven days of illness. Dogs continue to be the main carrier of rabies in Africa and Asia and are responsible for most of the human rabies deaths worldwide. Humans most often become infected with rabies through the bite or scratch of an infected dog or cat. In developed countries rabies continues mainly in wild animals. The disease is transmitted to domestic animals and humans through exposure to infected saliva. In the past few years, bat rabies has emerged as a public health problem in the Americas and Europe. For the first time in 2003, more people in South America died from rabies following exposure to wildlife, particularly bats, than from dogs. Human rabies deaths following exposure to wild foxes, raccoons, skunks, jackals and wolves are very rare. Livestock, horses and deer can become infected with rabies, but although they could transmit the virus to other animals or people, this rarely occurs. People most at risk of rabies live in rural areas of Africa and Asia. An estimated 31 000 people die from dog rabies in Asia each year. In Africa the annual death toll is 24 000. Dog rabies is responsible for more than 14 million courses of post-exposure treatment to prevent the onset of disease. The economic burden of rabies in the developing world also takes a large toll. The average cost of rabies immunizations after a suspicious animal bite is US$ 40 in Africa, and US$ 49 in Asia. This post-exposure treatment is a major financial burden for most households in these countries, where the average wage is about US$ 1 to US$ 2 per day, per person. 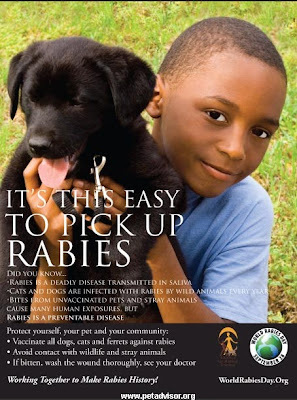 Poor people, especially children, are at highest risk of dog rabies. About 30% to 60% of the victims of dog bites (the primary mode of virus transmission) are children less than 15 years of age. Children often play with animals and are less likely to report bites or scratches. In areas known for rabies, professionals with frequent exposure to animals (e.g. veterinarians), or who spend a lot of time outdoors (e.g. wildlife specialists or researchers), particularly in rural areas, should be vaccinated preventively. This also applies to travelers and hikers who visit areas where bats are commonly found. Post-exposure care to prevent rabies includes cleaning and disinfecting a wound, or point of contact, and then administering anti-rabies immunizations as soon as possible. Anti-rabies vaccine is given for Category II and III exposures. Anti-rabies immunoglobin, or antibody, should be given for Category III contact, or to people with weaker immune systems. When humans are exposed to suspect animals, attempts to identify, capture or humanely sacrifice the animal involved should be undertaken immediately. Post-exposure treatment should start right away and only be stopped if the animal is a dog or cat and remains healthy after 10 days. Animals that are sacrificed or have died should be tested for the virus, with results sent to responsible veterinary services and public health officials so that the situation in the area is well documented. The WHO guide on preventive immunizations against rabies is aimed to ensure that effective and potent treatment is provided, even where vaccines are in very short supply - as is the case in many developing countries. Alternative, more economical vaccination approaches have been successful in developing countries where funding for vaccines and vaccine supplies are limited. Health staff must be well trained in techniques and vaccines must be stored appropriately for effectiveness. Rabies immunoglobulin (antibody) vaccines - which are recommended for use in Category III cases and for exposures in immunosuppressed people - are expensive and can be in short supply or non-existent in most developing countries. Purified equine (horse) rabies immunoglobulin provide at least a partial solution to current problems of insufficient quantities and the high cost of human immunoglobulin in developing countries. Safe and effective vaccines are available to prevent rabies in animals, and in humans before and after suspected exposures. Vaccination of domestic animals (mostly dogs) and wildlife (such as foxes and raccoons) has led to reduced disease in several developed and developing countries. However, recent increases in human rabies deaths in South America and parts of Africa and Asia evidence that rabies is re-emerging as a serious public health issue. The most cost-effective strategy for preventing rabies in people is by eliminating rabies in dogs through animal vaccinations. A lack of awareness of the effectiveness and feasibility of this prevention approach hinders elimination of human cases. As shown in several countries - such as Japan and Malaysia - elimination of rabies in dogs can result in elimination of transmissions to people and other animals. Preventing human rabies through control of domestic dog rabies is a realistic goal for large parts of Africa and Asia. Prevention of human rabies must be a community effort involving both veterinary and public health services. Rabies elimination efforts that focus on mass vaccinations of dogs are financially justified by the future savings of discontinuing post-exposure preventive treatment for people. We do home visits for treatments, in following areas. Home visit charges depend on the distance from clinic location. Click here to learn more about home visit veterinary service in Colombo.